Realidad VE is a small experiment that attempts to combine documentary material with virtual space for VR presentation. Last fall I had an extended interview with José Bergher a retired professor and classically trained musician from Venezuela who was the director of the Symphony Orchestra of Venezuela. Throughout his professional career he worked between New York City and Caracas and the reason behind the interview was to learn about that dual citizenry – about living between cultures and floating from one part of the world to the other. However as the interview progressed, I asked José about the current state of Venezuela – politically, economically and the common problems that people face day to day. He replied with a 20 minute discussion of the rise of Chavez and the current power-grab by Maduro and the lasting influence of Fidel Castro. I knew that this discussion would not be appropriate for the project that I was working on, but I appreciate his first-hand perspective and given the last several weeks in Venezuela, I wanted to present his voice in a unique format. Entirely based on my news consumption of current protests, clashes and seemingly general instability in Venezuela, I created a blank world with the exception of dead trees and abandoned drilling rigs. The world is populated by men and women running across the space. A boy sits against a tree taking in the world around him. At another spot a young couple argues and elsewhere two friends are in discussion. Along the entire perimeter paramilitary troops stand guard and watch the space. At a couple spots trios of soldiers have friendly discussions. In this world, the military is at ease, though watchful whereas the people appear frantic. I’m interested in combining documentary material such as the interview with José Bergher with virtual space and employing virtual reality as a platform for documentary. Jose’s discussion of current Venezuelan politics presented an opportunity for experimentation. Pictured above is the project for installation that features an animated José Bergher above the virtual space, the project is online with out Bergher’s video, only his voice accompanies the virtual space as the inclusion of video made an already long load time much longer. Unfortunately, the only portion of this description that resonates is the playfulness. 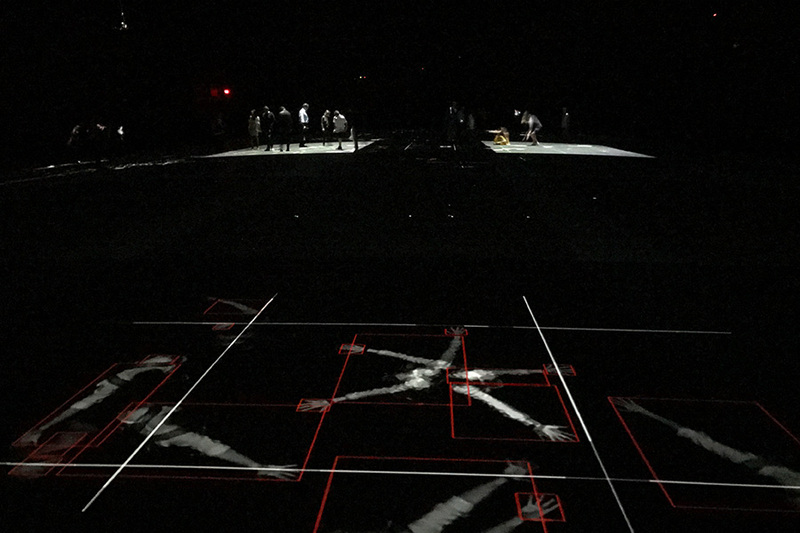 Indeed Herzog, de Meuron and Weiwei have created a dark environment in which visitors may skip around and play with light traces of their image. However, the installation lacks strangeness, eeriness, politics or any psychological reverberation. 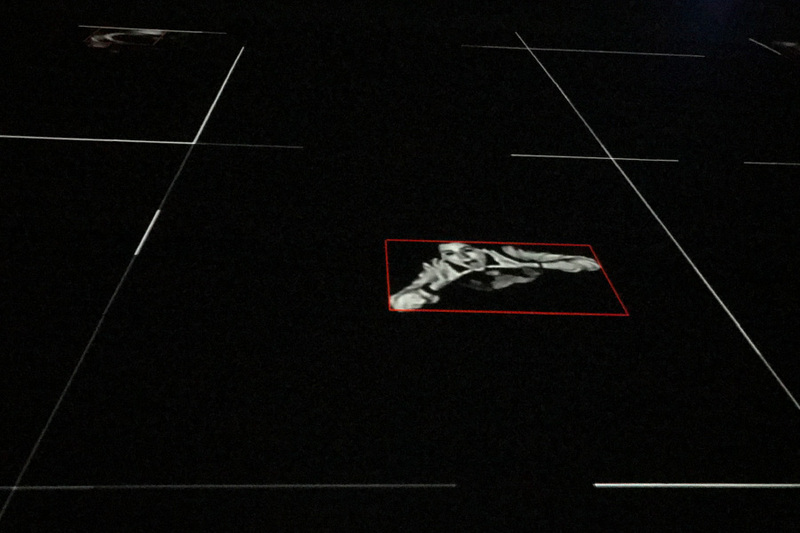 Other than the initial moment of discovery that one’s image is being projected on to the ground after it is periodically taken due to on one’s movement in the space, the installation presents very little that is interesting. The drones may have been a neat prop had they not been tethered. The second part of the installation is a didactic revelation of what the installation is trying to allude to – that we are objects of surveillance. As far as a critical art installation regarding surveillance, there was much more interesting work done 15+ years ago. Perhaps the theme of surveillance has been so overly investigated and picked apart by art previously and by entertainment today (“Black Mirror” for example) that such an installation seems trite and naive. There is so much of our data being captured today, that building an installation that merely plays upon facial recognition and motion sensors is just kind of dumb, but it is playful. So if $16 is worth the cost of running around a huge dark open space and playing with light projection, check it out. Once again discovering what this city has to offer, there I was with Ricardo walking into a venue called the Armory near Hunter College, a place I had never been before to see a new art installation called “Hansel & Gretel”. He had been keen to check this out for a few weeks, and like the curious creature I am, I followed along. We received a quick intro and were instructed to read a phase on the wall before entering -which i forgot- and then allowed to enter. We walked into black nothingness. My immediate reaction was to scramble for Ricardo’s hand. I didn’t realize the massiveness of this place until my eyes adjusted from the summer sunlight to the darkness inside of the Armory. It was only eerie the first few minutes because I had no idea where the hell I was walking. There were a few cameras far above us hanging from the ceiling and lights that would follow us. As we continued to walk, our movement was detected, grid lines would appear and cameras would be activated to capture our moves. Suddenly, it was playtime! It was fun to pose in different positions to watch the resulting snap shot of yourself illuminated on the black floor. At one point my sweater and shoes came off and I really got into it. Ricardo noticed two drones hovering on one side of the space living poor unfulfilled lives- tied onto leashes without free movement. It would have been more interesting if they were chasing people around. After exhausting our ideas for poses, the novelty wore off and we were ready to enter part deux of the installation. For that, we had to exit this part of the Armory and enter from another entrance on the other side of the street. After pausing in front of a camera you were allowed inside. There were many ipads on long tables with apps. You could elect to have your face identified and then search the cameras for your photo which was taken in the first part of the installation. That was cool. You could read about the history of surveillance, or access cameras to spy on others walking into the exhibits. The Armory itself was impressive, the installation not as much. It was a new, interesting experience- a fun activity for kids, I would say. I didn’t leave with the feeling that I had witnessed an impressive statement against today’s constant scrutiny and monitoring that we are all under. I didn’t feel intruded upon. There wasn’t anything menacing or fantastical as is described in the program leaflet. It was just pretty cool and fun. Perhaps the work behind the installation was complicated, but with my lack of technical know-how, I failed to appreciate the amount of effort involved. To have truly made an impact, more could have been done to confuse or play with the audience with the intention of throwing them off or perhaps even scaring them. Coupling that with the sound of Russian men having conversations in the background (that felt clandestine in nature), and I would have possibly left quite feeling differently. I don’t play fantasy sports, not because I wouldn’t enjoy it, but more so because I’m not enough of a sports fan. I am however a measured political junky, so when I learned about the Trump Administration Fantasy League, I discovered a fantasy sport that I could find the time and interest to join! Join the Trump Administration Fantasy League by using the site’s random number generator to draft seven unique players from Trump’s administration that includes a selection of 29 players. Then track the league news via Twitter and see your players gain points! The creator of the site Matt McCaleb has been closely monitoring the latest news on the Trump administration to maintain up to date player stats! It’s tough to select a team, do you go for the most outspoken that may be out of the game sooner than later such as Bannon or the sleazier ones that may play the long game such as Devin Nunes? And why are Eric and Donald Jr Trump one figure? This is the latest animated loop inspired by traversing the city. Whether walking or on public transit, observations of urban life trigger visual ideas that are rendered as brief animations. Audio accompanying the animations are recordings from urban walks as well as interviews with NYC residents. The audio accompanying this animation is from a brief excerpt from an extended interview with my 86 year old neighbor Louise. I’ve spent a good chunk of time this past year learning Unity3D. Although I’ve primarily been covering Unity for 3D and VR content, I wanted to build a 2D game as well and a first version is nearly finished! “Ometepe” – a 2D platformer type game is set on the island Ometepe in Lake Nicaragua where you control El Chapulin Colorado who defends the island from ecological havoc wrought by President Daniel Ortega and Hong Kong Billionaire Wang Jing has they attempt to construct the Nicaragua Canal. (If ever realized, the Nicaragua Canal would entail the largest movement of earth in the planet’s history. I plan to complete the game and have it available this July 2016! I don’t recall what compelled me to start saving images from the Hong Kong protests last year. However, as I saved them, I began manipulating the digital files by changing the files extension to be able to open them in a basic editor as text and to read the meta data on the images. As I did so, I would rearrange the data making up the image itself. It seemed appropriate to confuse the file by cutting data, changing the order of the data or adding new data. Not unlike the Occupy Movement here in the United States, the Umbrella Revolution appeared as a young and inspired population that would eventually dissipate against an all powerful ruling force. Perhaps, when this generation comes to power, they will recall the energy and desire of this time. I’ve decided to arrange the images into a small book that is available on Blurb or you can merely view the images online. Below are a few images from the series of 20. Opening this Friday, September 25th 2015 “a geography of being: una geografia de ser” as part of Transitio_MX, Festival de Artes Electrónicas y Video, on view through 4 October, National Center of the Arts, Mexico City. The festival consists of various exhibitions, workshops, lectures and discussions. “a geography of being: una geografia de ser” is part of the exhibition “play ? game [play[not]game] //más allá de la caja negra (beyond the black box)” curated by Brian Mackern. Since 2005, The National Council for Culture and Arts, through the National Center of Arts and the Multimedia Center, has been organizing the Electronic Arts and Video Festival, Transitio_MX, which has become Mexico’s most important platform for expression and contemporary practices in artistic creation that are linked to technology, as well as hybrid productions created by the merge of art, science, technology and humanities. Play “a geography of being: una geografia de ser” online or with Spanish subtitles. a geography of being is an interactive art installation that reflects upon the dynamics of the undocumented immigrant population in the United States, specifically in relation to undocumented youth. 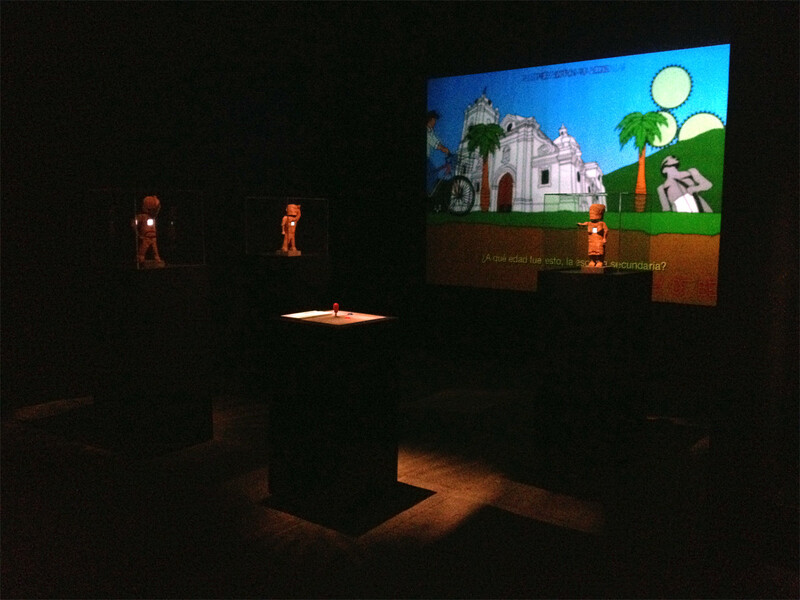 The installation consists of wooden kinetic sculptures with animated displays titled “Undocumented Drones” and a video game that places the player in the role of an undocumented youth that must face several challenges in the search for self-determination beyond the imposed constraints of citizenry. 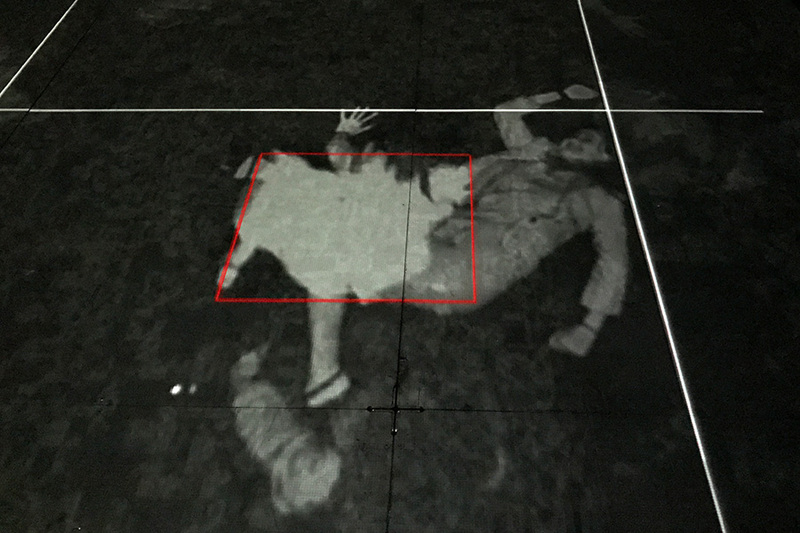 The visitor to the installation plays the game, the “Undocumented Drones” react to game play and may help the player along. The installation was on view at The New York Hall of Science from October 27, 2012 to January 13th, 2013 as part of the exhibition ReGeneration. The installation has been produced with the help of Cesar and Vishal, two young men who immigrated to the United States as young children. Their experiences and observations helped develop the game and determined the final goal of the game – self-determination. The conversations with Vishal and Cesar were incredibly revealing and extended the question of citizenry beyond civil status or politics to personal psychological realities. These are personal realities that effect friendships, romantic relationships as well as day to day life. For these two young men, a defining role has been that of activists and forming a powerful community in the New York State Youth Leadership Council. 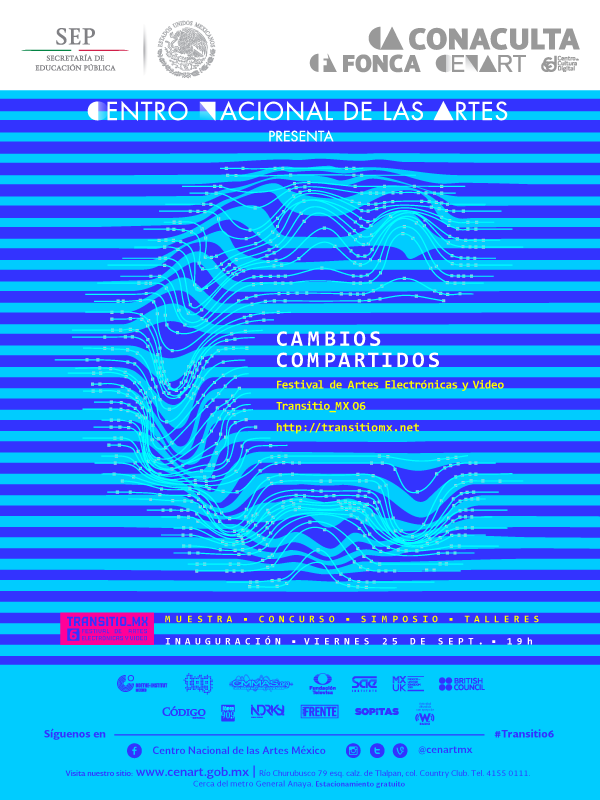 This year’s installation of Mexico City’s Festival of Electronic Arts and Video Transitio_MX 06 is titled “Cambios Compartidos” (“Shared Changes”) and opens Friday September 25th and runs through October 4th at the National Center of the Arts. 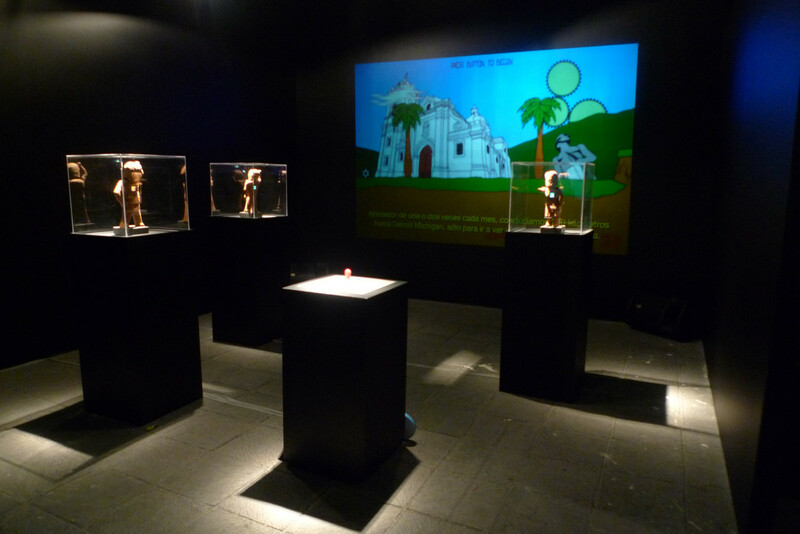 “a geography of being : una geografia de ser” will be on view and the game is available to play online.